Welcome to the World, Braden James Schultz! I had a very busy day planned on January 27th to keep my mind off of the fact that I was 3 days overdue and worried about induction, so my sisters-in-law Joy & Laura took me into the city and we did some shopping…even got some last minute (literally!) baby items for fun. I had a prenatal massage booked in the afternoon and my massage therapist said she’d work really hard on my hips to open them up for baby and that she’d do reflexology on my lateral malleoluses as that’s a contraction point. I told her I was hoping it’d work as I had a friend who’s baby dropped and went into labour 2 hours after her massage. Well….same happened for me! I was at Joy’s and literally within 2 hours I started getting irregular contractions. Laura took me home, I told Jay he probably shouldn’t go to volleyball that night, we ate supper and by 2300 the contractions were regular at 5 minutes apart. I called the hospital at 2330 and the maternity nurse told me to monitor myself for 20 more minutes and come in if they kept up. They were 4 minutes apart and picking up in intensity by that time, so I looked at Jay at 0115 and said, “it’s time!” We got to the hospital at 0200 and I was happy that when she checked me I was 3 cm and 50% effaced – it was the real thing! Contractions were really picking up in intensity in the next couple of hours, and I wanted a drug-free labour and was going to get checked at 0600, but requested to be checked at 0530 as I needed to decide whether or not I reeeeeeeeally could do this drug-free! So the nurse checked me and I was 7 cm! At least I was making good progress. She said she’d call the doctor and the reason why my contractions were so intense and that I felt lots of pressure was that my membranes were bulging. Dr. Maseka arrived at 0600 and gave me the option of whether or not I wanted my membranes ruptured. I had NO CLUE what to do, so I told him I trusted him and to go ahead. So he did rupture my membranes and he said I was at 8 cm and would have this baby at a maximum of 2 hours later. I told him that I sure didn’t think I could keep up with the contractions for another 2 hours, and he said it was his maximum guess and that he and the nurses thought I’d deliver sooner. So at this point narcotics weren’t an option, and I knew that if I opted for the epidural at the time it would take at least 30 minutes for the doc to get there and set up and give it….so I thought to myself – you wanted to do it naturally anyway – let’s give’r! The only comfortable labour position for me (the whole time) was on my back and gripping the bed rails with fists of fury with each contraction. 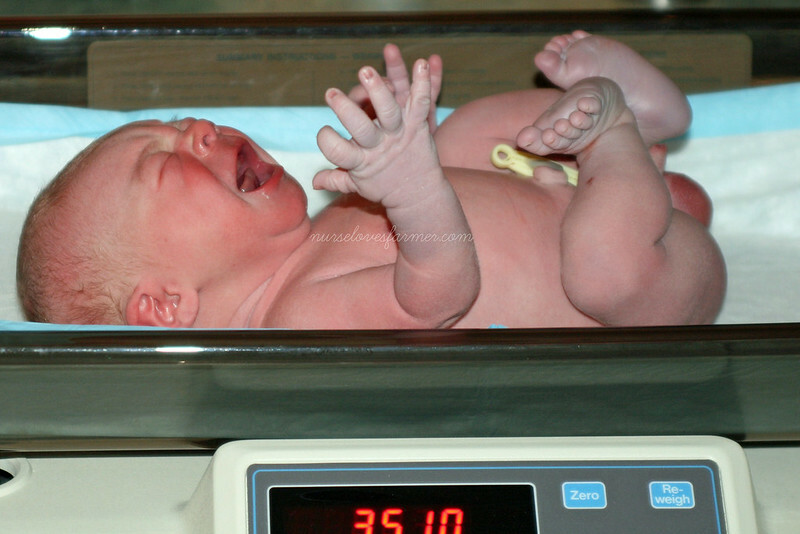 I had it in my head that I would be able to RELAX through each contraction so they wouldn’t hurt more….umm….yeahno!! It’s a pretty special birthday for Braden as he gets to share it with his Uncle Ben who turned 23 this year. Very tired, but happy mommy and Braden ready to go home! Braden already found his thumb! So we’ve been home for over a day now and we’re all just getting used to each other. Braden has met all of his cousins already and his Schultz grandparents live via Skype in Maui! My mom is here to help us out with everything for the first little while and everyone is doing great! Braden decided to cluster feed all night last night which is something I wasn’t prepared for at all, but I know there are a lot of things that we will discover together! 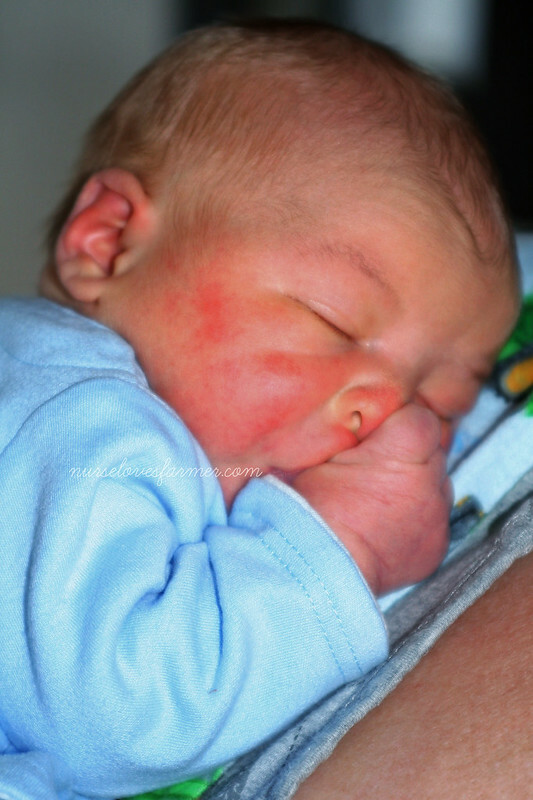 One of the biggest lessons I’m learning is that when Braden naps…Mommy must nap! So I’m going to do that now. Hope you enjoyed the story and the pictures! Found your blog by accident… I was actually cheering you on as I was reading this post! ha ha… I have had 2 natural deliveries and I'm expecting my 3rd child in November. Crossing my fingers (and praying) for another glorious childbirth experience. I too never felt so much like a woman, so empowered, in all of my life than when I delivered my 2 naturally. I wish every woman could experience it. Have you read "Natural Childbirth The Bradley Way"??? It really helped me (especially the 2nd time) with relaxation techniques. I am so proud of you Sarah!!! I knew you could do it drug free!!! It hurts but in the long run it's worth it, as you already know! Good job! I'm glad that massage did the trick. Can't wait to meet him! Yeah! Congrats! He's a beauty. Good for you! I'm so proud of all of you! He's a total sweetheart!! 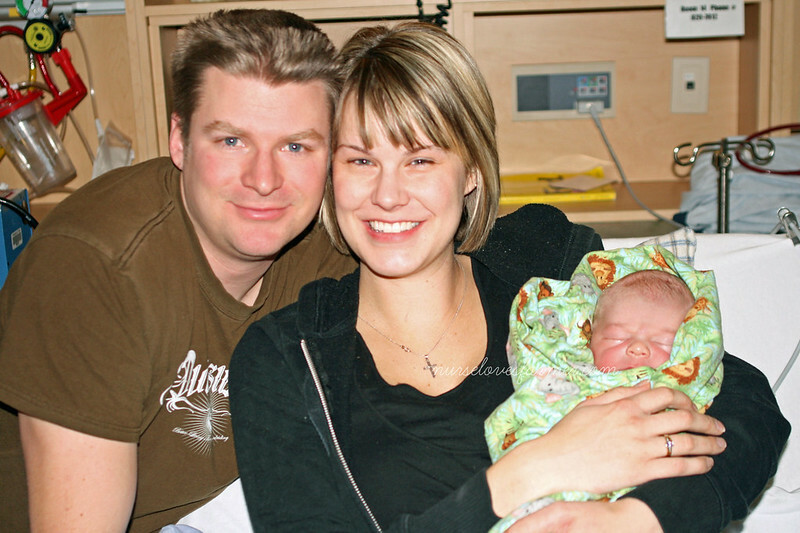 Awww great birth Story Sarah. Sounds like that massage did the trick. Hope everything continues to go so well. Braden is a beautiful baby!